Filed by Katherine Olivia, reporter. 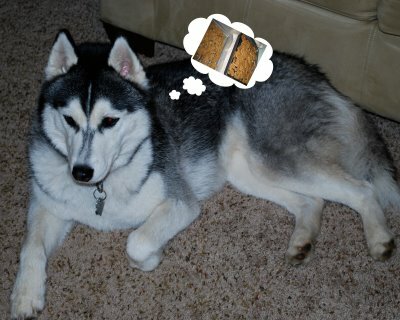 Will Steve, the handsome Siberian Husky, go hungry? That is the question that dogs everywhere are asking after the news was released just minutes ago that a FedEx truck, loaded with a box of Happy Hearts cookies, was hijacked and sent to Georgia instead of Washington. A spokesdog for Happy Hearts Inc, Maya-Marie, had this to say, "We loaded a huge box of cookies on the FedEx truck and they were to be delivered to Steve today, but the FedEx tracking system has the box in Georgia at this time." When asked for a response, Steve hung his head in sadness and could only say, "I will have to ration my remaining Happy Hearts cookies very carefully. No dog can be without Happy Hearts." Rumors are circulating that two other masked Siberians, Sitka and Cornelia Marie, might have something to do with these developments. Their last sightings place them in Georgia and it is a well-known fact that they are quite fond of Happy Hearts cookies. While Sitka and Cornelia Marie have no prior criminal records, the allure of Happy Hearts cookies cannot be underestimated. Another Happy Hearts Inc. spokesdog, Bella, had this final comment. "We demand that this travesty is made right! Steve should not have to suffer." Stay tuned to this news channel for further developments in this breaking story.